This excellent portrait of Naila Ayesh, and her role in the first Intifada is filmmaking at the highest level. 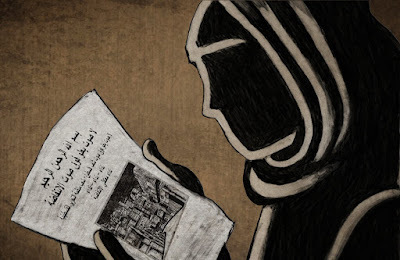 The film recounts Naila's life from a child when she became politically active because of her living in Gaza, through her marriage (to a man her parents were afraid would end up in jail) to her organizing of resistance and her role in the the first uprising which changed how the world saw the Palestinian/Israeli conflict. A beautiful marriage of talking heads, news footage and animated recreation the film does everything that a great documentary should. We are introduced to some amazing people and we watch how their lives unfolded and changed the world. It is an amazing story that grips us from the first instant and carries us to the last. What can I say about the film that will make you understand how good the film is? Perhaps simply I can't wait to not only see the film again but add it to my collection. This is a film that you will want to revisit not only because it's a hell of a tale but also because it is good time with good people. I apologize if this review isn't deep discussions and explanations of what I think of the events depicted. You don't need my thoughts when the film speaks for itself. All you need do is simply buy a ticket and take the ride. NAILA AND THE UP RISING is another truly great film playing at DOC NYC. See it Sunday. For tickets and more information go here.